The garden has grown gradually, between 1925 and 1939. 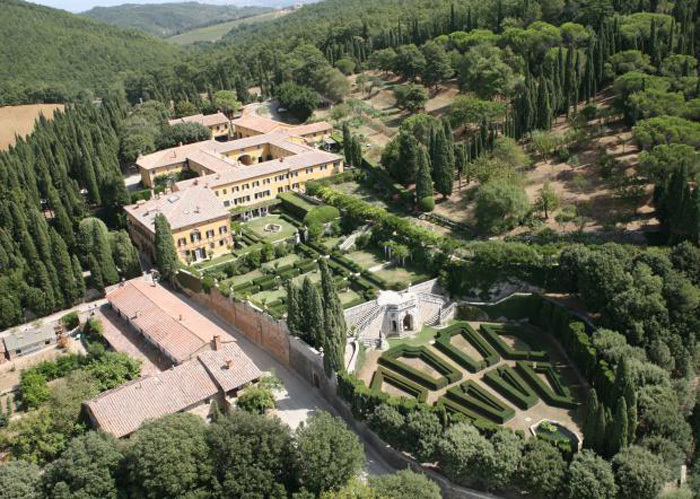 The House is surrounded by a formal Italian garden divided into ‘ rooms ‘ by geometric box hedges, with lemon trees in pots. Travertine stairs lead to the rose garden and an Arbor covered with Wisteria and bordered by hedges of lavender. Terraced slopes climb gently up the Hill, where cherry trees, pines and cypresses grow among wild broom, thyme and Rosemary, and a long avenue of cypress trees leads to a stone statue of the 17th century. A trail through the forest and connects the garden with the family cemetery, considered one of the best creations of Pinsent. Visitors are accompanied in the visit to the garden from our guide. It is not necessary to book your visit in advance; the tour lasts approximately 45 minutes and is conducted in Italian and English. At the end of the visit is not permitted to stay in the garden without driving.